The Boneyard and All Natural Pet Delivery will host a fundraiser in honor of the inaugural K-9 Veterans Day on Saturday March 10, 2012 from 6pm to 9pm. The goal is to raise money for the US Military K-9 Fund, established to support our military working dogs deployed with our troops to the Middle East and other overseas locations. The actual date for the first K-9 Veterans Day is March 13th. It has been set up in remembrance of all the working dogs who have assisted in duty at the sides of servicemembers beginning in World War II, right up through the present day. In fact, there are now more K-9 soldiers than ever before. 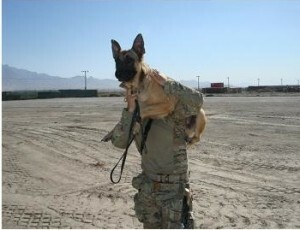 MWD Fama H176 is one of the newest K-9 veterans. She is a newly retired military working dog. She will be on hand at The Boneyard on March 10th to celebrate her new holiday. The US Military K-9 Fund is the Texas Chapter of the United States War Dogs Association Inc in Burlington, NJ. They are a stand-alone chapter, which means they get no funding from the national association headquartered in NJ, and have no legal ties with them. The work they do for the military working dogs is their own project. US Military K-9 Fund sends care packages to military working dogs where they serve. The packages include boots, cooling vests and mats, all of which aid them in staying cool in the hot climates where a great number of them are deployed. Also included are Doggles™ which are special goggles for dogs. These goggles provide them improved protection from the sun and sand. Cooling equipment is extremely helpful to dogs in hot, dry areas. The dogs benefit from these innovations in regulating their body temperature. The equipment keeps them cool and comfortable, but it is also important in helping them do their jobs. This is because heat can inhibit their sense of smell, prohibiting them from sniffing out caches of buried or hidden weapons and ammunition. Well-outfitted dogs are both happier and more efficient. Just like their human counterparts, military dogs need extra supplies from home. The military gives them practical and important tracking harnesses so they and their handlers can work well together. The equipment supplied by the US Military K-9 Fund is meant to supplement this basic equipment. K-9 Veterans Day gives these dogs the recognition they deserve as K-9 airmen, marines, soldiers, Navy SEAL team members and K-9 Units of the United States Coast Guard Border Patrol. K-9 Veterans Day has been a long time coming. Now that it is being recognized, it only seems fitting to use the day to benefit current military working dogs. The Boneyard and All Natural Pet Delivery intend to do just that. The US Military K-9 Fund, Inc. will put the donated funds to good use helping military working dogs around the world. Founder Bobbie Miller, a postal worker at an ACE Hardware Store, had been processing APO boxes going to Iraq and Afghanistan for over 9 years. When she saw a package going to a K-9 Unit in 2010, she decided to ask if it contained anything for the dogs, and the customer replied that she did not think there was. Bobbie asked to send the dogs some toys and treats, and was given the go-ahead. From that small beginning, the US Military K-9 Fund Inc grew and has sent more than 200 boxes to places as far as away South Korea, Japan, Iraq and Afghanistan. Ann Morrison is the Administrator of the Fund. Ann is an Air Force Veteran, retired from a career helping animal shelter dogs. Along with administration, Ann also spends her time assisting with fund-raising for US Military K-9 Fund. The Fund has been supported by individual contributors, companies that have offered reduced pricing and donations, and grant money from a local foundation. The US Military K-9 Fund, Inc. takes its job very seriously and intends to work hard to help as many military working dogs as possible. Was Texas A&M able to help Fama? The best person to ask is her caretaker. We are not sure but you can email her at: Ann Morrison . FAMA is a great hero! !